The war had ended but it was still summer. It was such a different morning, prosperous, defiant, even opulent with happiness. The fifty something kilometers along Damascus Road were very tense, fraught with disbelief. There was still a stench of burnt asphalt and tar, almost invisible after Bhamdoun, when you passed the ruins of the abandoned synagogue; it was like a signpost from elsewhere. The arrival into the womb of the valley was painless, but somehow suffocating. I stood by myself in front of the statue, to let all the difficult air sink in, and then like a miracle, the noise and the moisture stopped. You could hear the waters at the Berdawni breathe in slow agitation and Pierroti's "Our Lady" staring from high above, into the naked river. "Vin et la Poésie" was the name of Attar Samih's statue to Bacchus, mysteriously placed at the entrance of the city whose name is derived from the word "displace", in the language of the country. And that is exactly what I thought: How displaced are Bacchus' figurines, all alone and drunk in this valley. I tried to imagine the tunes that the Greek lyre, standing half idle by the side, had played in other ages of the world, in other years, less prosperous. The air thickened itself out and resembled the water of the fountain, "There's so much life here", I thought. How much I wanted to take over the square, to dance there under moonlight, to surround the entire uneven slope of the hill and flush the air with paint. But I guess no one had ever conquered Zahle, not even Attar Samih, and not even the Syrians. In 1981, the Syrians tried to take over the city and besieged it for over a hundred days, and set up roadblocks around the entire valley, to block the access to and from the entire city, that after all, connected the distant planets of Beirut and Damascus. 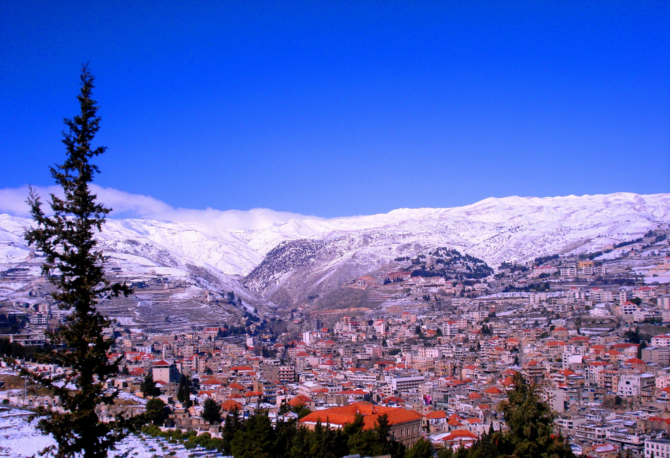 After trying to control the Hill of Jeha, in the valley surrounding it, and failing at it at the hand of the poorly armed Lebanese forces, the Syrians shelled the population of Zahle for sixteen days and sixteen nights. 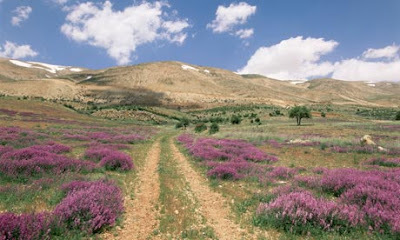 Bachir Gemayel, wrote to the besieged and tired fighters stationed in Zahle: "Because the road is still open for a few hours only... if you leave, you will save your lives and the fall of the city will be certain and this will be the end of our resistance... if you stay, you will find yourselves without ammunition, without medicine, without bread and maybe without water; your task will be to coordinate the internal resistance and defend the identity of the Lebanese Bekaa and the identity of Lebanon, and by that you will give a meaning to our six year war". And then some more. Besieged, the city was never defeated, neither was Samih's "Vin et la Poésie", standing there, almost naked, and holding modern history in contempt, with a certain naive glee of arrogance. But I didn't want to defeat it, to ransack it, like others had done. I wanted to know each and every corner of the valley, every flower, every brick, and every shade of light and darkness. How I had loved you then! As if you were a child, or a beautiful woman, or the son of a God. It just occurred to me that this couldn't be the task of one man alone. Saint Augustine writes: "For we call 'world' not only this fabric which God made, heaven and earth, but the inhabitants of the world are also called 'the world'... Especially all lovers of the world are called the world." It seemed to me as if the entire planet, and the whole collection of miracles to be found in the valley, aren't sufficiently enough to have a world. Worlds appear only in between men. And I felt a little sad, standing there, by myself, sharing in all the miracles, and without a world, a world to realize them, to transform them. So fragile everything seemed then, like a desert, so improbable, and the waters so loud, wanting to embrace the ocean, so far away from here, crossing the burnt roads and the bombed out buildings, from underneath, running away, from the streams and rivulets that stood up to the tanks, wanting also to forget. I guess I heard the river travelling in the direction opposite mine, and I still stood by the statue, unmovable, and so ready to travel. I was down the valley, in a place that almost meets the entire beauty of the world; it was a small plateau like no other, bursting into itself like a volcano, carpeted with flowers so purple that they resemble ponds of wine growing heavenwards, only interrupted by the trenches made decades ago at the hand of both villains and heroes, and the endless curiosity of the clouds. It was a field of lavender, like no other, growing spectacular legs, and running after you with the pace of a gazelle, confusing the tiny hairy leaves with grapes and berries. So godless it all appeared to me, half accidental and half abandoned. And infinitely solitary. Why would such a place exist if it cannot be contemplated? And why would it ever be contemplated by one man alone? I imagined the festivals from other times, the gifts of the world, and how one god after another, tried to claim this place as their own, failing each and every time; oh the valley... Rejecting peace but also war. So much life, and so much death, together, at once, in the same valley, under the sign of Saturn. And for so long, I hadn't thought about the statue and the valley, about the purple lavender and the fields and the rivers, perhaps trying to circumvent the obvious difficulty of having seen it alone. Not even God was watching then, for it was probably market day and he was collecting the tithes at a souk. Oh, how you love the world, I thought, especially from the position of beauty that immediately assumes an infinite distance from it as a pre-condition for participation in it. Once a friend had vaguely reminded me of the statue, and in gratitude I wrote him a long letter that then I sent to a foreign country, and sat across the void of a certain light, awaiting the response, or at least, even a postcard. And I somehow grew old from waiting, older than god himself... Thinking about this "problem" of the love of man, the love of the world, the love of God. Why is it that we must love God? Is it because of certainty or because of fear? Why is this world transient and passing? Why does it have to die, like us? Is the world not like a miracle too? I remembered a certain philosopher, from younger days, reading on a bench in Hamra, and something at this church, somewhere up the hill: "Would it not be better to love the world in cupiditas and be at home? Why should we make a desert out of this world? The justification for this extraordinary enterprise can only lie in a deep dissatisfaction with what the world can give its lovers. Love that desires a worldly object, be it a thing or a person, is constantly frustrated in its very quest for happiness." Why should it be a bad thing, though, I asked. Why all these guarantees and insurance policies with God? I suppose that the only cure to the irreparable damage of the cycle of life and the slaughterhouses of history is nothing of the eternal or immortal kind. Human bonds are like that, fragile, tense, haunted, and invincible only in the sense that they are nothing but temporary. The world will outlive us always, the human community, of the lovers, of both God and the world. So will the valley, since Canaanite god and Roman emperors occupied it, and then died. And that is how I found thee, friend from other ages, less violent and less godly, and there you were, wrapped entirely in a field of lavender, on a regular week day, so far away from the entrance of the city. I was suddenly reminded how badly I wanted to go there and how I loved every corner of it, every hue in the air, every color of the water; entirely unafraid of the risk of disappointment or unhappiness. It was so clear, everything, that day, like a bright summer morning, like the day when I first saw the statue; all the colors returned to the palette, like a thick rain falling over the sores of a volcano. I remembered all what I had seen, as if with somebody else. It was so pure, almost laughable. Where had we been lost all these centuries? I heard at last all the laughter, all the weeping, all the screaming... All what the Berdawni had wanted to tell me, that day, after the last war. I cheered the moment, it was a discovery, a miracle, the beginning of a world. It didn't resolve any of our wars, but it made it all look probable, possible and invincible. Maybe we'll conquer the valley after all, if only to dance at the square.